57. Make masonry chimneys swift-friendly. Chimney and Vaux’s Swifts nest in hollow trees and masonry chimneys. In many areas, these species are declining due to the loss of natural nesting sites. Maintaining nonmetal chimneys provides critical nesting sites for these birds. Since Chimney Swifts are in North America only during the warmest part of the year, there is seldom a conflict over time-sharing rights of a chimney. For a chimney to be suitable for swifts, the inside must be made of stone, firebrick or masonry flue tiles with mortared joints. These materials provide enough texture for the birds to cling to the walls. Metal chimneys are unsuitable and should always be capped. Any animal which enters a metal flue will fall to the bottom and be unable to climb the slippery walls. Proper maintenance is crucial for any chimney whether it is to be used by Chimney Swifts or for winter fires. Wood fires produce flammable creosote residue which coats the inside of a chimney. If left unattended, this material will build up and the entire layer may ignite. A resulting chimney fire will spew burning cinders onto the roof and surrounding structures. In extreme cases, intense chimney fires can cause an explosion. In most cases, an annual cleaning by a professional will keep the chimney walls clean and safe. Chimney Swifts build their nests by attaching small twigs to the chimney wall with their glue-like saliva. When completed, the shallow half-cup nest protrudes two to three inches from the wall. By keeping the chimney free of creosote buildup, home owners help assure successful nest building, decreasing the chances of the nest falling before the birds have fledged. The best time to clean a chimney is in mid-March when the wood fire season is over and just before the Chimney Swifts return from their Amazon Basin wintering grounds. When cleaning the chimney, the damper should be inspected and should remain closed during the nesting season. This will prevent birds from flying into the house and becoming trapped or injured. A closed damper will also prevent a nest which does break loose from falling into the fireplace. It also lessens the transfer of sound and will make the chimney quieter for the birds and home owner. In older homes some fireplaces may not have dampers, or they may be inoperative. In these cases, a large piece of foam rubber (do not use fiberglass insulation) can be wedged up from the fireplace to serve this purpose, while the swifts are in residence. Public support for swifts can be illustrated by the case of the chimney at Chapman School in Portland. For several years, the school’s heating plant remained closed until the [Vaux’s] swifts left in the fall, forcing the children to dress accordingly. Finally, Dave Eshbaugh, Executive Director of the Audubon Society of Portland, spearheaded a program to raise funds to rebuild the heating system and allow the chimney to remain unused for heating purposes. Funds came from citizens, metro, Portland Public Schools, and several foundations. The University of Oregon decided not to demolish the unused chimney on Agate Hall largely because of public support for the swifts. [UPDATE] Many people and organizations are now constructing Chimney Swift Towers to provide nest sites where too few masonry chimneys are available to support local swifts. 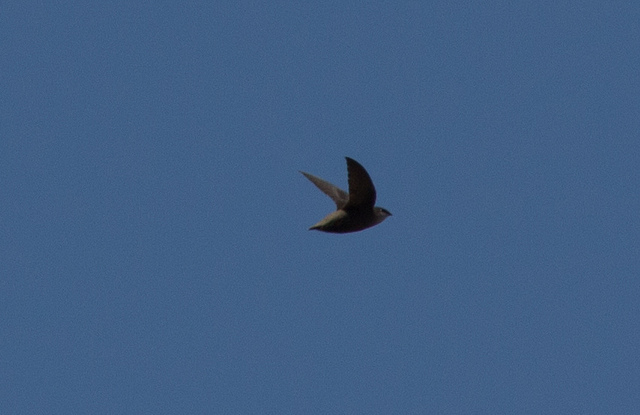 Plans and photos are available at the Chimney Swift Conservation Association’s website.